AS Pest Control provide an efficient, affordable and professional flea treatment service in Mansfield. Available 24/7 we offer a quick and reliable service to conveniently remove the flea problem. When there is a flea problem in a property it is usually the case that people will experience bites. Bites are normally concentrated on the lower leg, they can occur elsewhere and on children they are more evenly distributed as they are nearer the ground. The bites can cause itching or swelling. Some people react immediately others may take several hours to show the signs of a bite. Flea infestations can be caused by pets, by a visiting animal or occasionally brought in on clothing. They live in the carpets and leave them only to feed on the host animal (usually cat or dog). If a host animal is not available then they will feed on humans. Contact AS Pest Control and we can provide a free onsite flea treatment Mansfield quotation. If untreated fleas can cause discomfort to pets and humans, they can also transmit tapeworm. Flea treatment will not work unless the correct preparation is carried out. The floor area of the property should be vacuumed and cleared of books, toys, boxes, magazines etc. Areas under beds, settees and other furniture should be cleared. Pets and people should be out of the room during treatment. AS Pest Control provide Flea Treatment in Mansfield starting from only £60. Insecticide is used to treat floor areas and sometimes furniture and animal beds. Pets should also be treated with a specific pet formulation such as Frontline. Flea treatment to pets should be continued even after the eradication of the fleas to help prevent the return of any infestation. Once treatment has been completed do not let pets walk on treated surfaces until the insecticide is dry. If bare skin comes into contact whilst the insecticide is wet ensure this is washed off. Do not vacuum the treated areas for at least 2 weeks. After the first vacuum ensure the contents are disposed of in an outside bin. For the first week of vacuuming, vacuum at least once a day but ideally twice. The flea infestation will not be controlled immediately and may even increase slightly initially after treatment. After 7 - 14 days the infestation should die out. Ensure that pets are regularly treated with an appropriate flea formulation as any remaining fleas are likely to feed on the animals rather than humans. 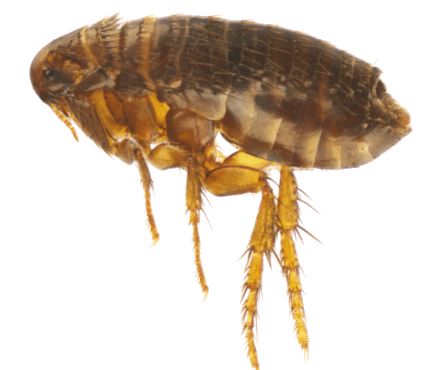 AS Pest Control provide a local, affordable flea treatment solutions for residential and commercial customers in Mansfield, Nottingham, Derby, Chesterfield, Worksop and surrounding areas.